A movement for patients, relatives and carers. 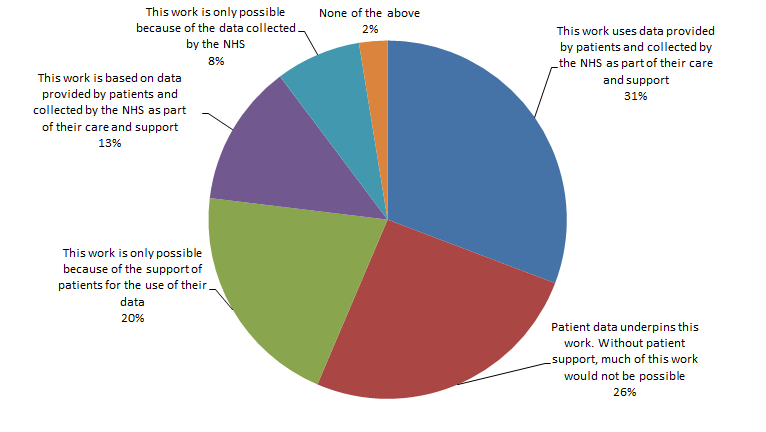 "This work uses data provided by patients and collected by the NHS as part of their care and support"
In 2015 use MY data proposed the inclusion of a citation on all publications using patient data, to state that the data used within the publication comes from patients. The citation would be a recognition of some of the benefits of using patient data, and would acknowledge the patient contribution as well as highlighting how the data has been used. The proposal was initially discussed with use MY data members, then at a joint workshop with patients and cancer researchers at the annual conference of the National Cancer Reseaech Institute (NCRI) and was also discussed as a principle at a joint workshop at the All Party Parliamentary Group event, Britain Against Cancer. The voting breakdown is shown in the graphic. Following the conclusion of the voting, we wrote to organisations that use cancer patient data and requested that the citation be used, reflecting the wishes of use MY data members and the public. The UK and Ireland Association of Cancer Registries responded in early 2017 following a meeting of the Association, indicating that they would be pleased to adopt the citation across their work, from March 2017. In June 2017, large numbers of presentations and analyses at the Public Health England (PHE) Cancer Data and Outcomes Conference included the data citation for a large, mixed audience for the first time, with very positive feedback. The Public Health England (PHE) Office for Data Release were also asked whether they would consider making it a condition that all academic outputs using PHE data should adopt the citation wording. In July 2017 they indicated that they intended to implement this for all contracts raised from July 2017 onwards. Understanding Patient Data have supported the citation, highlighting the importance of keep giving the message that patient data underpins research and care. They have encouraged everyone to use this citation on all work underpinned by patient data including publications, event materials and press releases. The citation is now widely used across a range of outputs and publications from large numbers of academic institutions and commercial organisations and has been adopted national bodies such as the NIHR, Public Health England, the Office for National Statistics and many research charities.